As regular readers of this blog will know, I somehow managed to get through the first five months or so of being a regular buyer and reader of Marvel Comics without picking up a single book featuring the work of perhaps the single most important architect of that publisher’s fictional universe — that would be Jack “King” Kirby, of course — but, come June, 1968, I went on a Kirby tear, buying not one, not two, but three different comic books that showcased the King’s art. 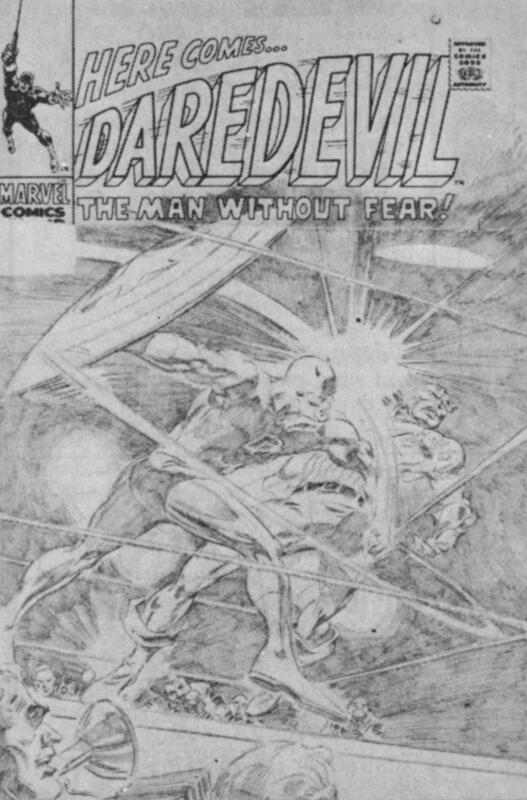 Of course, Daredevil #43 could only boast a cover by Kirby, as the interior art was by the book’s regular penciler, Gene Colan (with embellishment by inker Vince Coletta). And since I was by this time a regular purchaser of the Man Without Fear’s title, the fact is that I would have bought this issue even if the cover had been by Colan, rather than Kirby — which, as the penciled art shown to the lower right should indicate, it indeed almost was. 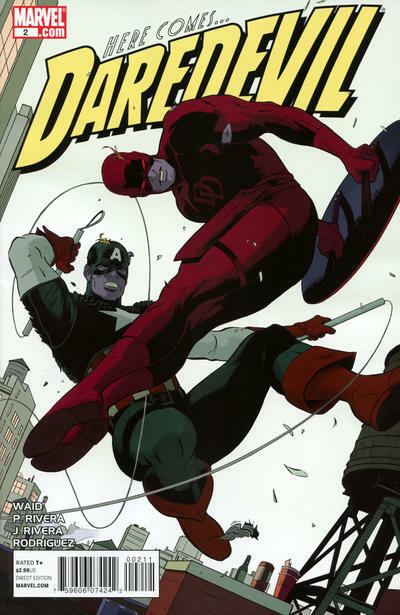 Colan’s sketch gives the figures of Daredevil and his guest star equal weight, more or less, although the foregrounding of DD’s figure, as well as the moment of action the illustration captures — with Cap being on the receiving end of ol’ Hornhead’s roundhouse punch — throws the balance of emphasis to the headliner. It’s anyone’s guess why editor-writer Stan Lee rejected Colan’s cover and replaced it with the one we got, penciled by Kirby and (according to the Grand Comics Database) inked by Joe Sinnott — by 1968, it was a fairly rare occurrence for Kirby to draw the cover of a comic that didn’t include any interior art by him — though Nick Caputo’s surmise that Lee wanted to highlight the Star-Spangled Avenger’s appearance in what may have been a lower-selling title seems reasonable, as does the suggestion of “Bob” at the Jack Kirby Comics Weblog that he may have been uncomfortable showing DD getting the better of Cap, even momentarily. 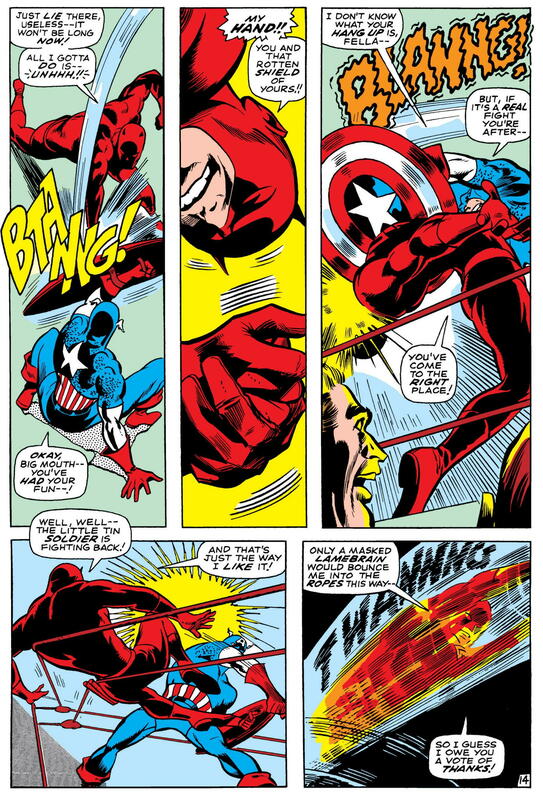 Obviously, in Kirby’s version, Captain America is the dominant figure, regardless of the fact that he’s not shown landing a blow, simply by virtue of the foregrounding and, even more importantly, the size of the figure — one that takes up so much real estate on the cover that it necessitates an adjustment to the book’s logo, with the usual “Here Comes…” tagline jettisoned, to be replaced by a modified version of the “The Man Without Fear” subtitle that would usually appear below the titular hero’s name. 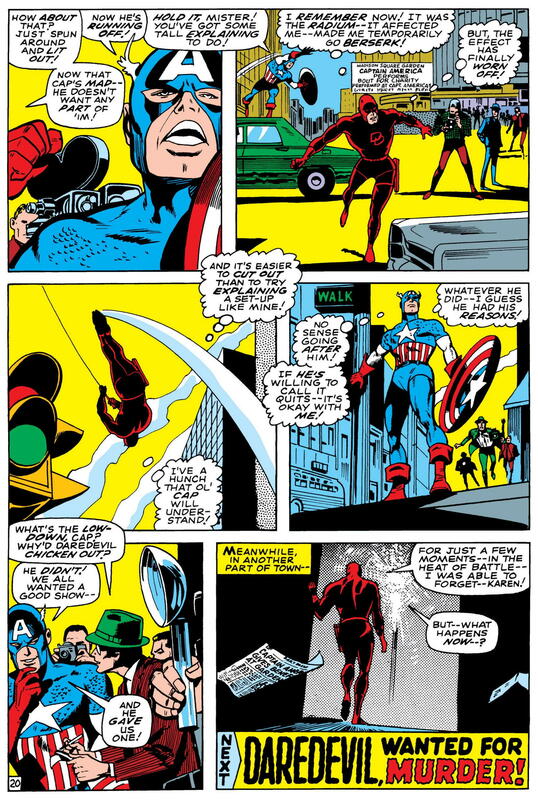 * It also seems unlikely that, without that dominant and dynamic rendering of the Sentinel of Liberty by the character’s co-creator, Lee would have felt emboldened enough to not even use Cap’s name on the cover — writing a blurb that, instead, simply heralds a special appearance by “You-Know-Who”. 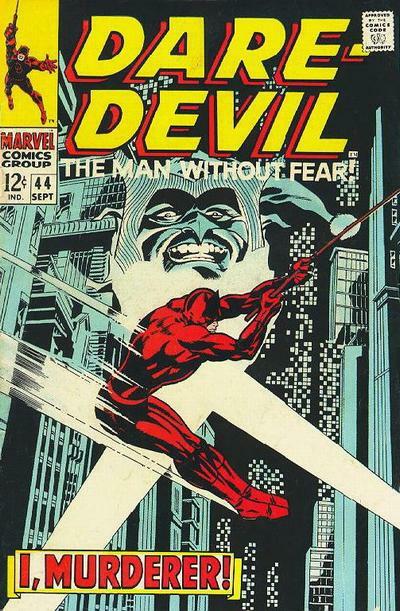 Regardless of why and how the cover came to be, however, it’s great that we have this illustration of Daredevil by Kirby — a relatively rare beast, since the Scarlet Swashbuckler was one of the relatively few major Marvel characters of the early Silver Age whose adventures Kirby never regularly penciled. What’s this? 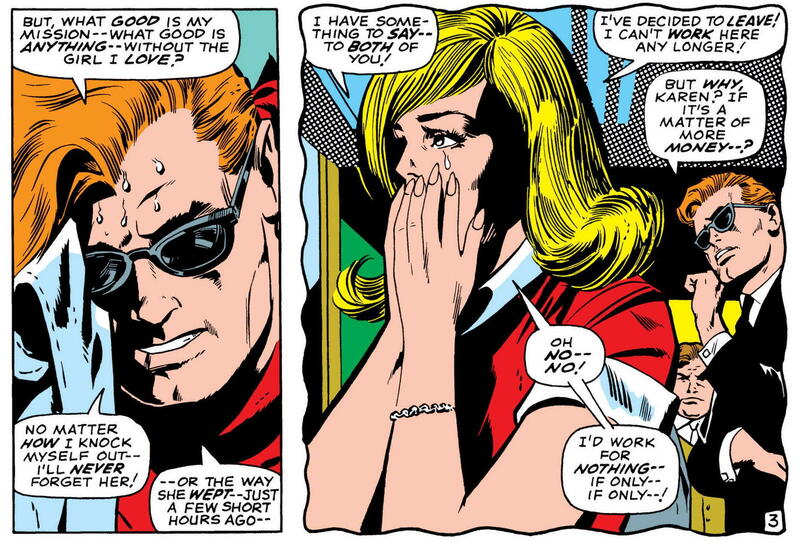 Matt Murdock has “lost” Karen Page? When the heck did that happen? 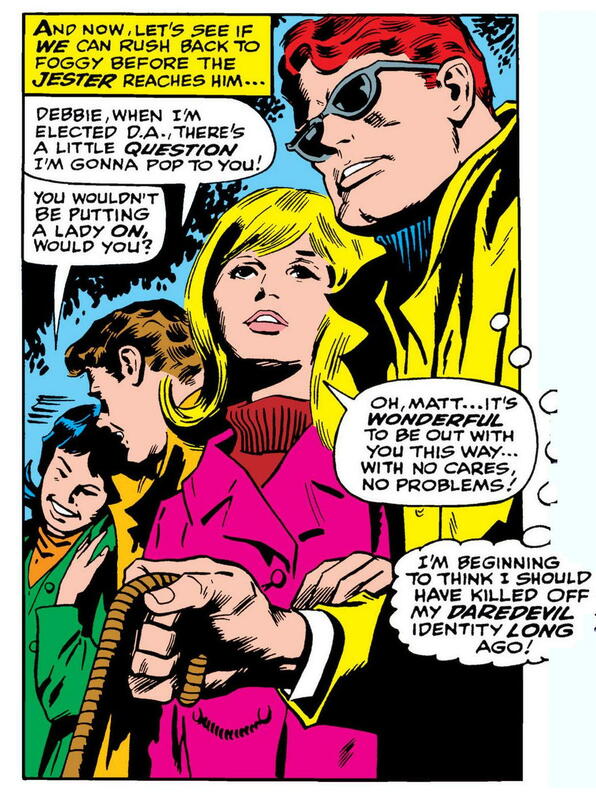 The last time we saw them together, in issue #42, they were enjoying a nice stroll in the park with their friends Foggy Nelson and Debbie Harris, and everything seemed to be going fine. (Check out the panel to the right, if you don’t believe me.) At least it did until a new villain named the Jester suddenly arrived on the scene and kidnapped Matt, but that’s another story. Attaboy, Matt! Obviously, the best way to help ease the emotional anguish of the woman you love is to drive her away in a cruel, dickish manner. It’s for her own good, dammit! Yeah, this kind of thing “happens all the time”, doesn’t it? I mean, you can’t turn on the TV or pick up a newspaper these days without learning about someone stealing a doctor’s bag chock full of radioactive material, amirite? Believe me, in 1968, it was even worse. 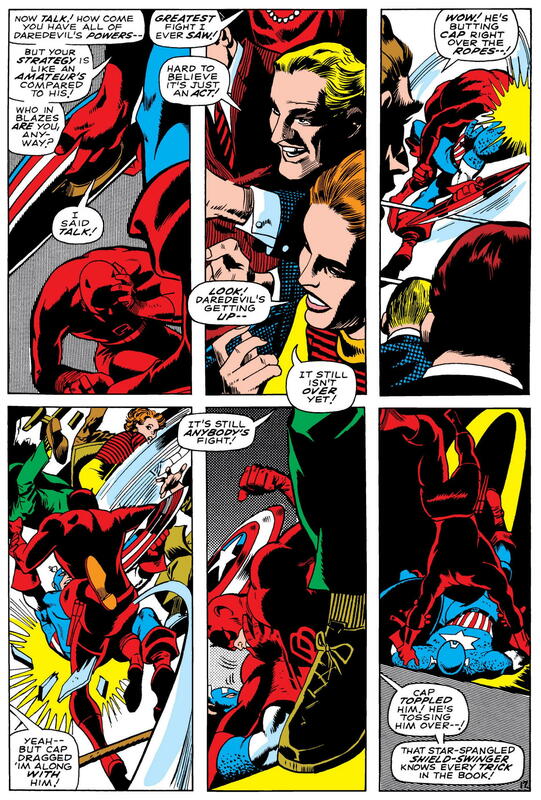 Over the last three pages of action — thrillingly choreographed by Colan — DD has largely had the upper hand, mostly because Cap has been holding back. 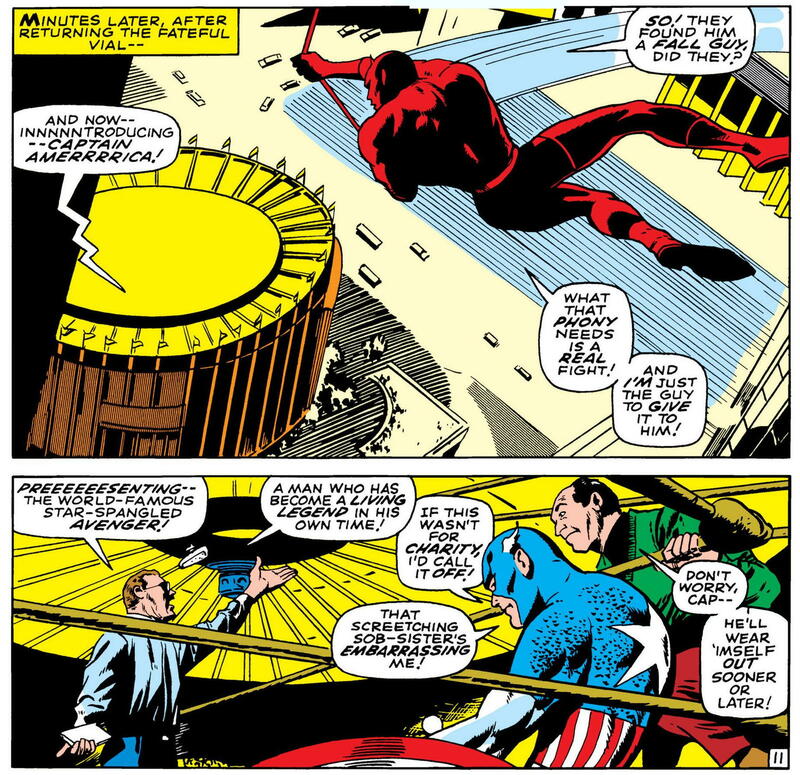 But now that Cap has figured out he’s fighting an impostor, it’s on, fer realz!!! 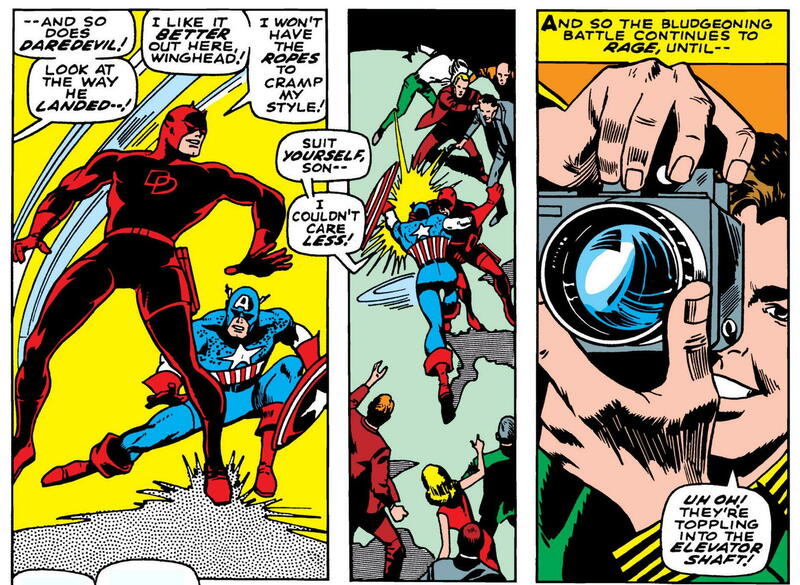 Except — Cap isn’t fighting an impostor. His statement to DD about the latter being sick, and not knowing what he’s doing, is actually 100% right on the money. So why does he think he’s not fighting the real guy? 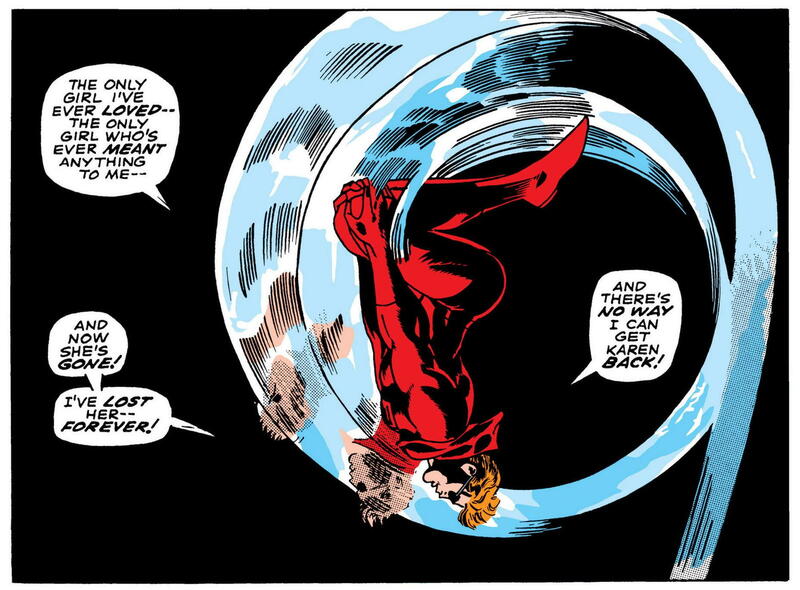 “…all of Daredevil’s powers…”? Um — what powers? 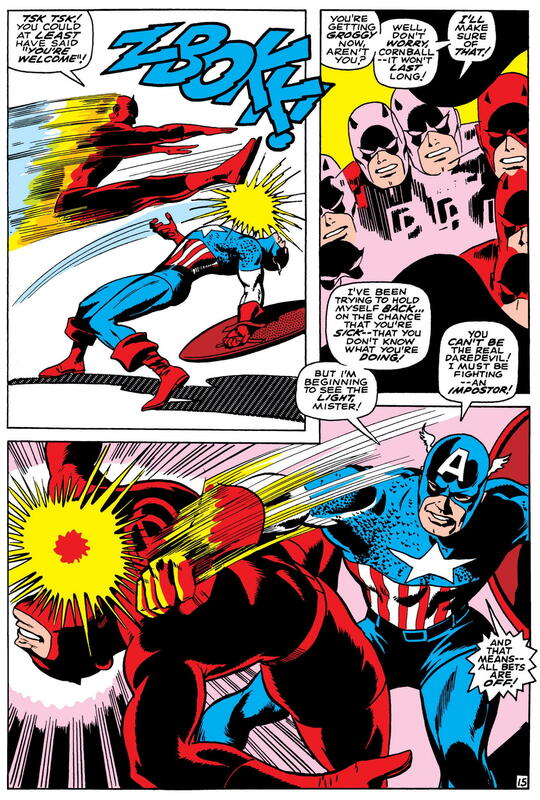 Not being privy to DD’s secret identity, and thus not knowing his opponent is a blind man, Cap shouldn’t be aware that DD has any powers. Ol’ Hornhead presents as simply a highly-skilled costumed acrobat and hand-to-hand fighter, much like Cap himself. Say, does that unnamed, partially-obscured photographer look like Peter Parker to you? 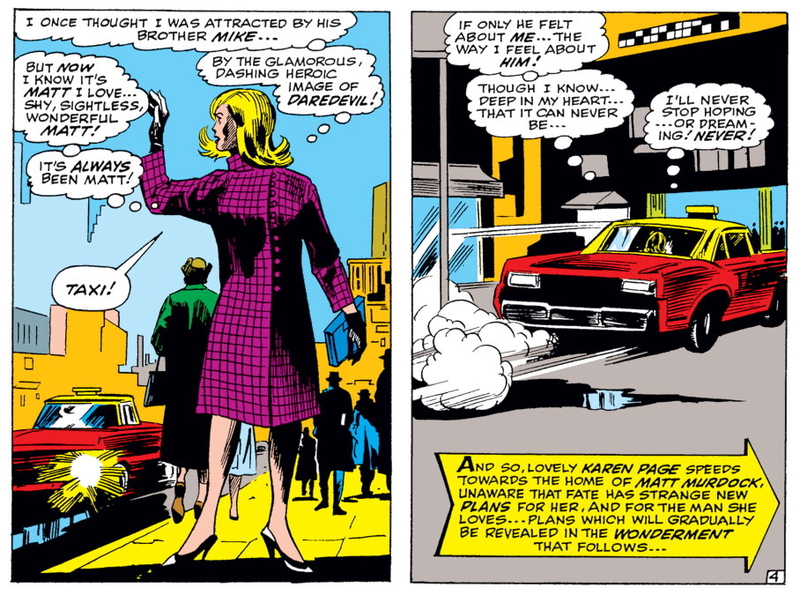 He does to me, too (just as he did when I first read this story fifty years ago), and according to the good folks at the Grand Comics Database (yes, them again), we’re both right. Cap and DD do indeed go tumbling down the elevator shaft, just like Pete said, but don’t die, because: 1) cables; and 2) they’re super-heroes. “Um… sorry? My bad. 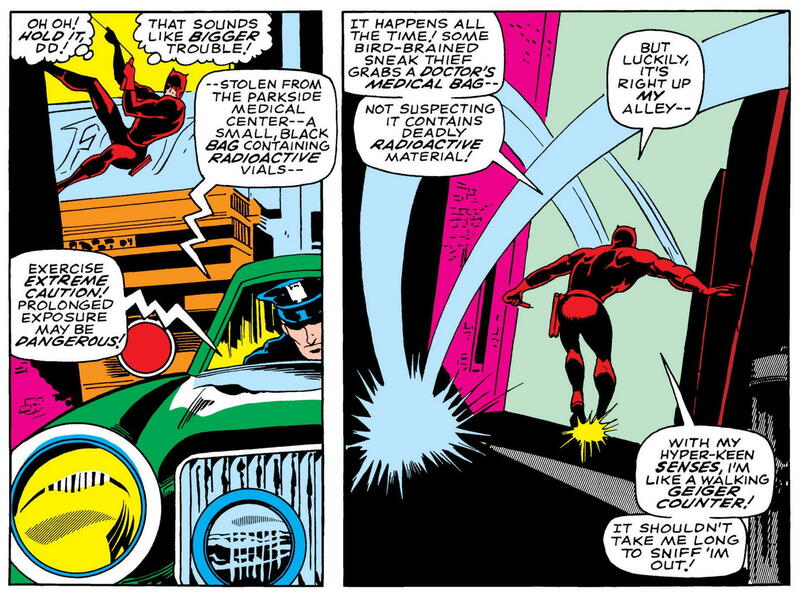 See ya ’round, m’kay, Cap?” And then cue Road Runner “zip” sound effect as DD beats feet out of there. 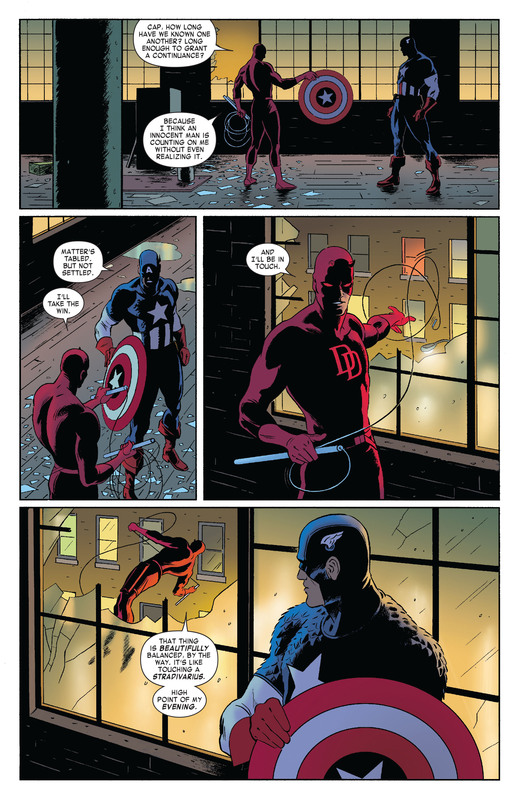 Yeah, Daredevil’s probably right about Cap understanding. He’s that kind of guy, after all. 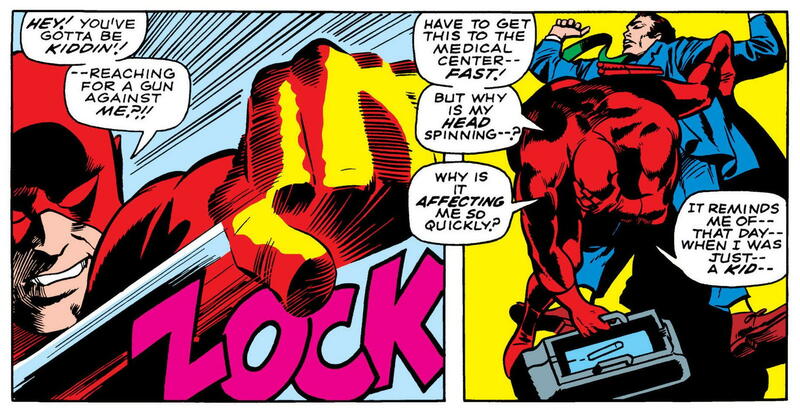 And like most dust-ups between heroes in Marvel comics of the Silver Age, nobody really got hurt — so, no harm, no foul. 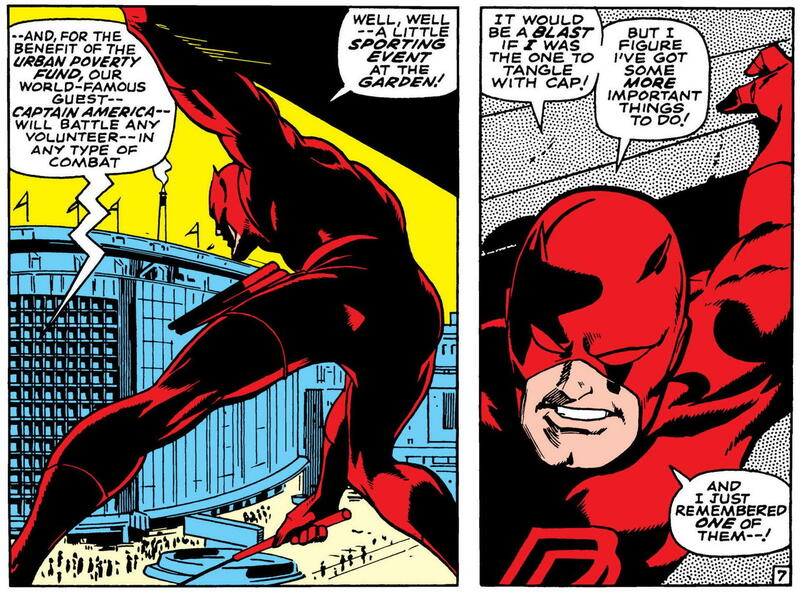 And that’s it for the forty-third issue of Daredevil. Not a terribly consequential issue — more of a breather between last issue’s tale introducing the Jester, and a three-part rematch with the villain that immediately follows — but a good bit of fun, nonetheless. 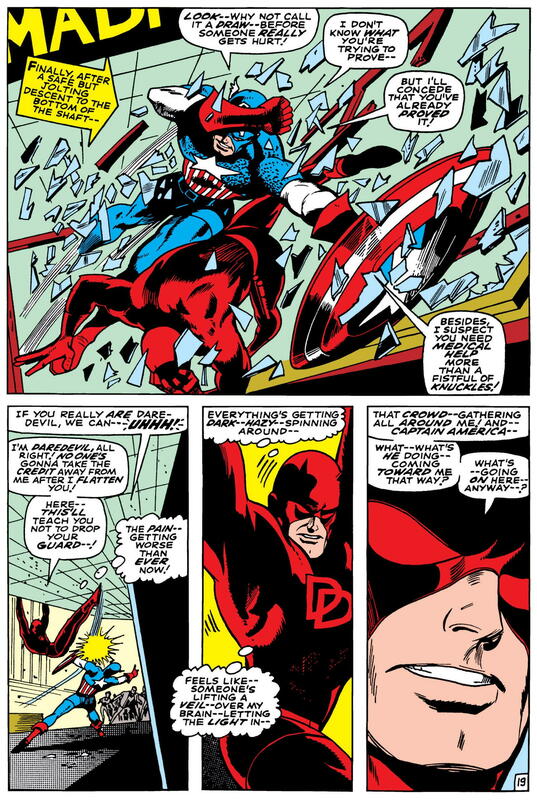 A satisfying read — unless you really and truly expected Lee and Colan to settle once and for all who would win in a fight, Daredevil or Captain America. I mean, c’mon. This story was, I’m fairly certain, the first time that the Man Without Fear battled the Living Legend of World War II — though, of course, it wouldn’t be the last. They’ve had a number of hostile encounters over the decades, most involving some sort of mental impairment or, at best, a serious misunderstanding (as fights between heroes tend to do), and most also ending inconclusively. 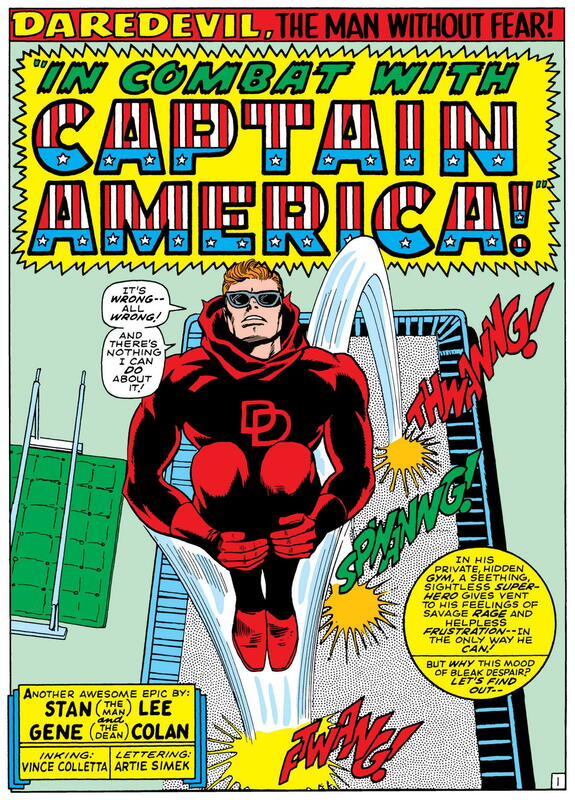 The most recent one that I’m aware of is also one of the best; it appeared in the second issue of the Daredevil series that began in 2011, and was written by Mark Waid, with art by Paolo and Joe Rivera. The story, coming near the very beginning of Waid’s acclaimed four-year run on the title, finds Matt Murdock dealing with the repercussions both of having his secret identity as Daredevil exposed and of having recently been possessed by a demon in Marvel’s 2010 “Shadowland” event. 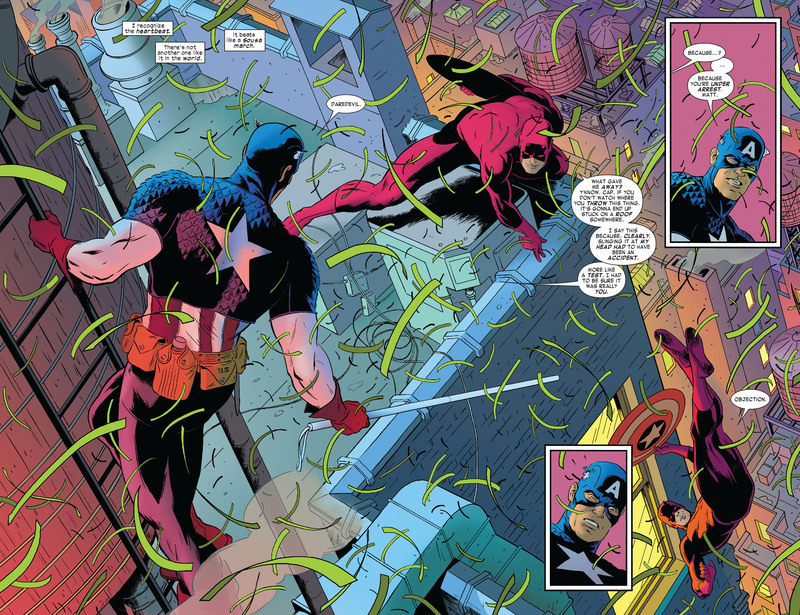 For his part, Steve Rogers is dealing with having recently been returned to life following his “death” in Marvel’s first “Civil War”, as well as having returned to the role of Captain America following the apparent murder of his replacement, Bucky Barnes, in 2011’s “Fear Itself” event. (Yeah, that is a lot of events, isn’t it? But that’s comic books, these days.) It’s in this context that the confrontation between the two heroes occurs. 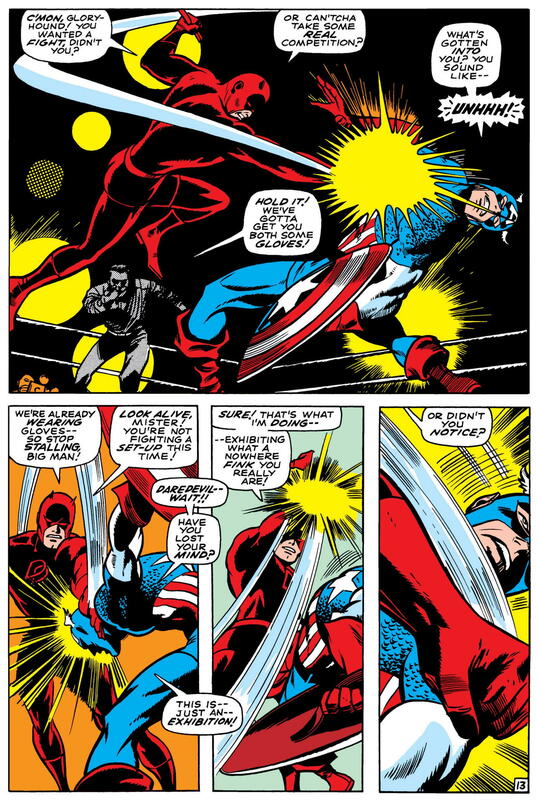 Over the next few pages, we get to watch Cap and DD fight each other using the other guy’s weapons (Cap swings the billy club, while DD wields the shield), while lawyer Matt appeals to Cap’s sense of justice by pulling out “the Bucky defense” — i.e., just as Bucky Barnes was being manipulated against his will when he committed heinous crimes as the Winter Soldier, so Daredevil was under external control when he did a lot of bad stuff during “Shadowland”. 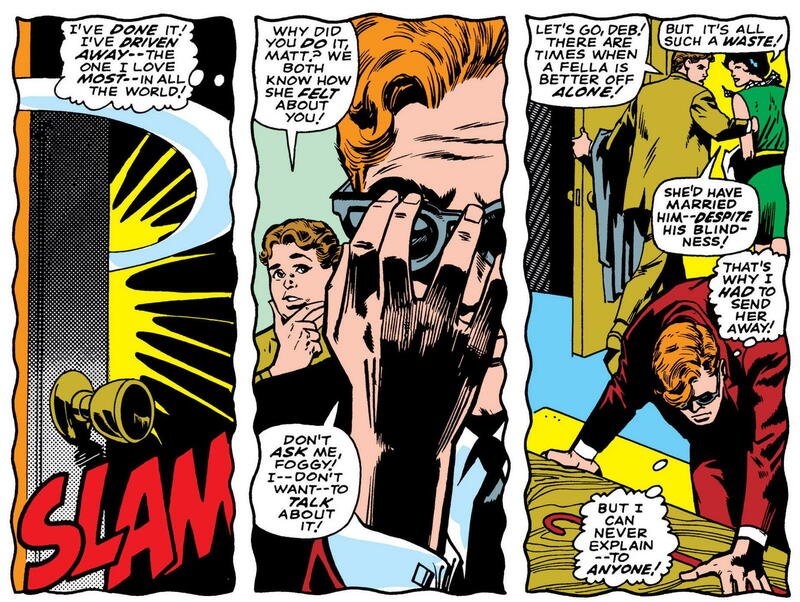 And, in the end, Matt’s reasoning convinces Steve to let things lie — at least for the moment. “High point of my evening.” Man, what a great line. Yeah, the whole thing is wrapped up by the story’s eighth page, and maybe one could make a case that the cover’s spotlighting of the DD-Cap tussle as if it’s the centerpiece of the issue is a little misleading. I don’t care. It’s a wonderfully written scene, demonstrating Waid’s flawless understanding of both characters, and the fight itself is beautifully staged by the Riveras. The rest of the issue is great, too. No one who reads this comic book should put it down feeling like they haven’t gotten their money’s worth. Unless, of course, they were expecting it to settle, once and for all, who would win in a fight. I mean, c’mon. *Issue #43’s logo could be considered a transitional one, as the following issue, #44, would feature the debut of a brand-new logo. This split-level, hyphenated design would go through several iterations over the next few months, before the old logo returned in all its glory with issue #48. Great blog. nice entry. I still have #43 bought it new. 2 of my fave Marvel characters. Great insight you provide. Thanks. Glad you enjoyed it, Brad! The cover to DD #43 by Jack Kirby is fairly iconic, and I’ve seen it reprinted t least a few times over the years. I’ve never had an opportunity to actually read the issue, though, so I appreciated your summary. Thanks for sharing that, Ben! I don’t remember ever seeing that Frenz cover before.